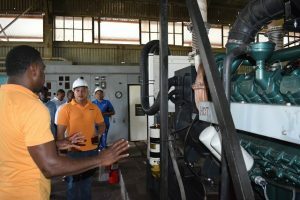 Officials on a tour of the electricity generation plant at Kwakwani where two new generators were recently installed. Residents of Kwakwani are now benefiting from improved electricity supply as a result of the installation of two new generating sets by the Kwakwani Utilities Inc. (KUI), the Ministry of Public Infrastructure said Thursday afternoon. A ceremony commissioning the two new 260 kilowatt generators was held at the Power Station. The new sets more than meet the demands of the community, government said. That is according to KUI’s General Manager, Mr. Fitzhubert McPherson, who said that the new sets will allow for much improvement within Kwakwani. McPherson has been General Manager since January 2017. “When I took over, there were a lot of complaints and people were dissatisfied with the power they were having cause it was on and off…and the thing is, you weren’t notified about the power outage. With that, I sat with the technical guy and I said we have to get this thing right and we started doing checks and tests,” he was quoted as saying in a release issued by the Ministry of Public Infrastructure. He foresees the new sets allowing residents to enjoy 24 hours of electricity, a marked difference from the irregular access they previously faced. The old engine, he added, was in dire need of overhauling. “We had two CAT sets before; one engine was costing us a lot of money due to a leak it had that was throwing away most of the oil,” McPherson explained. He further said that the decision to purchase the new engines was taken following a July 2017 study by the Ministry of Public Infrastructure. Meanwhile, McPherson emphasised that KUI is serious about ensuring the longevity of the new sets and, as a result, staff members have already been exposed to training in the use of the new engines. “We had a transition to get people knowledgeable of the new sets because we don’t want any mishaps. The representatives from Doosan [the engines reseller] are here doing on the job training, getting the guys them sensitised on how to put the engines on and off. There’s a special way to do it and deviating from that would cause a lot of problems,” McPherson explained. He hopes to have at least two members of staff exposed to more training. Furthermore, McPherson anticipates a massive expansion project to get underway thanks to the new engines. “With these new sets, we’ll do a lot of expansion; cause a lot of people are without power and a lot of businesses are without power so with these two new sets there will be a lot of improvement within the community,” he said. While KUI currently serves approximately 1,200 metre households, this number is expected to grow as the company turns its sights to lighting other areas such as West Bank Kwakwani, Jonestown, New Scheme, and Staff Hill.